Stable radicals that are present in carbon substrates interact with paramagnetic oxygen through a Heisenberg spin exchange. This interaction can be significantly reduced under STP conditions by flowing a diamagnetic gas over the carbon system. This manuscript describes a simple method to characterize the nature of those radicals. Green, U., Shenberger, Y., Aizenshtat, Z., Cohen, H., Ruthstein, S. Exploring the Radical Nature of a Carbon Surface by Electron Paramagnetic Resonance and a Calibrated Gas Flow. J. Vis. Exp. (86), e51548, doi:10.3791/51548 (2014). While the first Electron Paramagnetic Resonance (EPR) studies regarding the effects of oxidation on the structure and stability of carbon radicals date back to the early 1980s the focus of these early papers primarily characterized the changes to the structures under extremely harsh conditions (pH or temperature)1-3. It is also known that paramagnetic molecular oxygen undergoes a Heisenberg spin exchange interaction with stable radicals that extremely broadens the EPR signal4-6. Recently, we reported interesting results where this interaction of molecular oxygen with a certain part of the existing stable radical structure can be reversibly affected simply by flowing a diamagnetic gas through the carbon samples at STP7. As flows of He, CO2, and N2 had a similar effect these interactions occur at the surface area of the macropore system. This manuscript highlights the experimental techniques, work-up, and analysis towards affecting the existing stable radical nature in the carbon structures. It is hoped that it will help towards further development and understanding of these interactions in the community at large. Substrates of varying (wt%) ratios of C/H/O atoms present different types and concentrations of stable radicals that are detectable via Electron Paramagnetic Resonance (EPR)8. These radicals depend on the structure of the macromolecules and are highly influenced by their aromatic nature. The EPR spectrum of coal radicals is characterized by a single broad resonance. In such cases, only the g-value, the line width and the spin concentration can be obtained. The g-values of EPR spectra can be used to determine whether a radical is carbon-centered or oxygen-centered. The basic equation for the electron Zeeman interaction defines the g-value, where h is the Planck constant, v is the constant mw frequency applied in the experiment, B0 is the resonance magnetic field and βe is the Bohr magneton. For free electrons the g-value is 2.00232. Variations in the g-value from the 2.00232 are related to magnetic interactions involving the orbital angular momentum of the unpaired electron and its chemical environment. Organic radicals usually have g-values close to the free electron g, which depends on the location of the free radical in the organic matrix3,8-10. Carbon-centered radicals have g-values that are close to the free electron g-value 2.0023. Carbon-centered radicals with an adjacent oxygen atom have higher g-values in the range of 2.003-2.004, while oxygen centered radicals have g-values that are >2.004. The g-value of 2.0034-2.0039 is characteristic for carbon-centered radicals in a nearby oxygen heteroatom that results in increased g-values over that of purely carbon-centered radicals11-15. Line-width is governed by the spin-lattice relaxation process. Therefore, an interaction between adjacent radicals or between a radical and paramagnetic oxygen results in a decrease in the spin lattice relaxation time, and hence, an increase in the line-width4-6. Stopped flow experiments with EPR detection allow the observation of time-dependent changes in the amplitude of an EPR signal at a distinct field value during the interaction of two phases by time sweep acquisition (kinetic display). The result of such a measurement is a rate constant for the formation, decay or conversion of a paramagnetic species. The procedure is analogous to the well-established case of stopped flow operation with optical detection in which a time-dependence of the optical absorption at a distinct wavelength is observed. Typically stopped flow experiments are conducted in a liquid state as radicals that are not EPR detected in liquid state due to short relaxation time T1, as e.g. hydroxyl (OH×) or superoxide (O2-) cannot be studied directly by EPR-stopped flow techniques. It is, however, possible to study the spin-adducts of these radicals with nitrones, yielding nitroxide-type radicals (spin-traps), as they are EPR-active and their kinetics can be monitored also by stopped flow EPR16-18. The method of measurement of rates of chemical reactions using fast-flow gaseous techniques with EPR detection has also previously been established19-22. In essence, the method depends on the measurement, by EPR, of the concentration of a reactant as a function of distance (and thus at a constant velocity, the time) over which the reactant has been in contact with a reactive gas in the flow tube. Conditions whereby the concentration of the reactive gas is approximately constant are usually employed so that the measured decay is pseudo first order. In the current work, a simple gas flow setup was implemented and a constant flow of gas was introduced to the surface of the solid carbon substrate. With the method detailed in the current work we succeeded in achieving interesting results where this interaction of molecular oxygen with a certain part of the existing stable radical structure can be reversibly affected simply by flowing a diamagnetic gas through the carbon samples at STP. As a result of this method the removal of the interacting paramagnetic gas uncovers a new radical surface with a g value, which is closer to that of a free electron. Grind the carbon samples to the desired fraction size (here, coal samples were ground to a fraction size of between 74-250 mm). During the grinding process the grinder should be held in a regulated environment (AC cooled to 20 °C). Additionally, purging the grinder chamber with a flow of nitrogen gas prior to grinding minimizes oxidation at this stage. Transfer the carbon samples to sealable canisters and replace the air atmosphere with nitrogen. Keep the samples in a temperature regulated room (AC cooled to 20 °C). Place each of the samples in an open glass vial inside the vacuum oven (Figure 1A). Close the vacuum oven door and replace atmosphere in the chamber with nitrogen or argon, then heat to 60 ºC. Hold these conditions for 24 hr. Turn off the oven and allow the temperature to reach room temperature. Then, open the oven and remove the sample vials. Stopper the sample vials with rubber septa and an aluminum cap (Figure 1B). Use a vacuum system (Figure 1C) to remove all traces of oxygen. Connect the vial to the system and seal valves 1-5. Turn on the vacuum pump and pressure gauges. Open valve 1 and wait till the monitors show a vacuum of ~0.1 mbar. Make sure leakage is minimal by closing valve 1 and counting to 30. If the increase in pressure is not more than 3 mbar than the seal of the system is sufficient. Open valve 2 and remove the atmosphere in the vial – wait till the pressure returns to the initial pressure value determined in step 1.14 and again test for leakage. If multiple vials are being done at the same time (valves 2-4) then repeat step 1.15 for each valve. After achieving a vacuum and effectively purging the vials of the remaining atmosphere, replace the atmosphere with a desired gas. Close valve 1 and immediately open valve 5 and allow the pressure to reach 0.5 atm. Close valve 5 and open valve 1 to remove the gas, and wait until return to the starting vacuum valve (purge 1). Close valve 5, open valve 1 to remove the gas and wait until return to the starting vacuum valve (purge 2). Close valve 1 and immediately open valve 5, and allow the pressure to reach 1.0 atm, then close valve 5. Close valve 2 and remove the vial by gently pulling downward and removing the needle. After removing the vial open valve 1 and purge the gas from the vacuum system. Before turning off the vacuum pump open valve 2 to allow air into the system and simultaneously turn off the pump (this prevents a backflow of the oil). Rinse the EPR tube with ethanol and dry with N2. Remove the aluminum seal from the desired coal sample. Gently turn the open end of the EPR tube into the vial filled with the carbon sample. Depress and turn the EPR tube, then gently tap until the sample has evenly dispersed at the bottom. Fill the tube in this manner up to a length of at least 1.5 cm. Seal the tip of the tube with rubber Teflon putty of about 0.5-1.0 cm length of putty (Figure 2A). Insert the quartz tube into the EPR resonator, make sure that the section of the EPR tube filled with the coal is filling the entire resonator cavity. 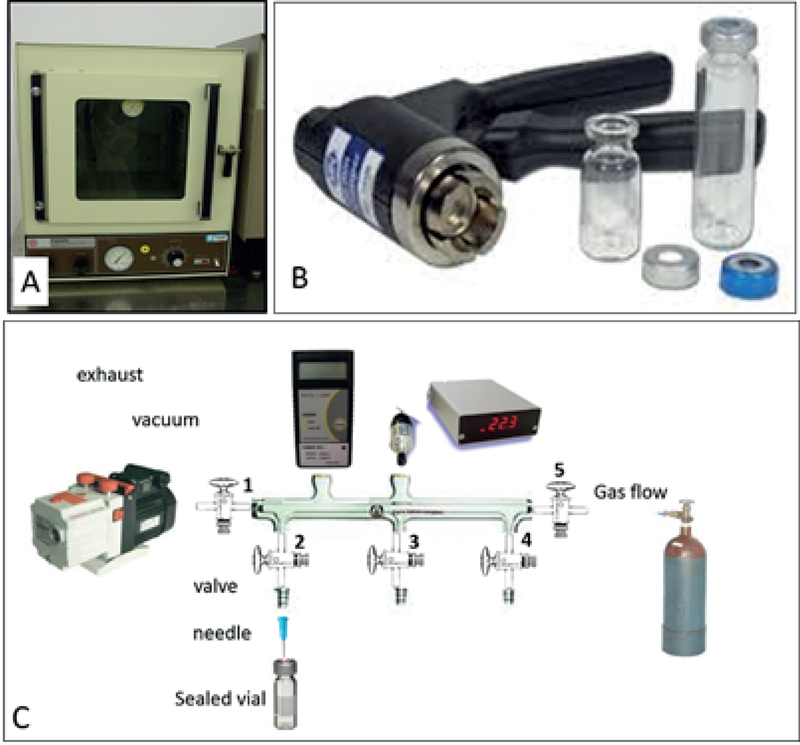 The EPR measurements reported here were conducted at room temperature 292-297 K.
Set up a tank with the desired flow gas (N2, CO2, He) make sure there are 2 operation valves in order to control the flow (Figure 2B). Connect a rubber tubing to the tank. Ensure that the length reaches the tip of the EPR quartz tube with enough pull so as not to put strain on the quartz tube. Connect a flow controller to the rubber tubing to monitor gas flow. Insert the tube through the rubber Teflon putty by using a small gauge needle. Insert the needle until it is in close proximity (about 3-4 cm above the coal surface) to the sample but far enough away from the sample so as not to affect the magnetic field (Figure 2C). Leave flow off (turn on flow ONLY after tuning). Poke a hole in the rubber putty to release the outflow gas. Turn on the EPR spectrometer. Tune with no gas flow. Open the microwave tuning panel, locate the dip at 33.0 dB power, and use auto tune for obtaining the best tuning conditions..
Set the microwave power to 2.0 mW, at this power there is no saturation. Open 2D experiment, as a function of magnetic field and time. After the sample has reached equilibrium and there is no further change in the EPR line shape, at these parameters after about 25 CW-EPR spectra that were measured with 120 sec delay between them, stop the gas flow. Expose the sample to an air atmosphere and continue with the measurements until 50 spectra are obtained, or until equilibrium is reached. There is no need to tune again after stopping the gas flow. The measurement is continuing automatically, with 120 sec delay between each CW-EPR spectrum. If equilibrium is reached at a slower rate, increase the number of points as a function of time. If equilibrium is reached at much faster rate, decrease the delay time between each scan. % combine the spectrum of the two species. %plotting the experimental and simulated spectra. When preforming the EPR experiments on various coal samples, as a function of the exposure time to a diamagnetic gas flow it was noted that during the gas flow, a second species at g~2.0028 appeared. This g-value is close to the value of a free electron and consistent with unsubstituted aliphatic carbon centered radicals. However, the total spin concentration for each sample remained constant within our experimental error (±10%). Figure 3A presents two scans: 0 sec and 1,900 sec after the coal sample had been exposed to CO2 gas (HA). The EPR spectrum at 1,900 sec is characterized by two species. One at g=2.004 with a line width of 5.5 G, and a second species, which is much narrower at g=2.0028, with a line width of 2.0 G. For HA, it was found that the rate of formation of this second species is ~500 sec (Figure 3B). However, the rate of formation of this second radical species is different for each coal sample, and was found to be within the range of 100-5,000 sec. Interesting, the extent of the formation of this second species, after stabilization is similar for all coal samples, and was evaluated as ~4-5% relative to the initial spin concentration. Whereas, the rest of the spins corresponds to either g~2.003-2.0032, carbon centered radicals (BA, SA), or g~2.004 (carbon centered radical with an adjacent oxygen atom). The different g-values of the dominant radical species in each sample is dependent on the nature of the coal, as was reported before8. After the gas flow was stopped, and the coal samples were exposed to air at aerobic conditions, during this time, the system went back to equilibrium, each coal sample with its own kinetics. Since, the kinetics of the formation of this second species for each coal sample is different, it should indicate on the sample's pores area and the surface functional groups. In order to better characterize these functional groups, other techniques such as BET and NMR are required to supplement the EPR data. Figure 1. A. Vacuum oven for drying the samples. B. Sample vials. C. A custom made vacuum system. Please click here to view a larger version of this figure. Figure 2. A. EPR quartz tube filled with carbon and closed with Teflon putty. Needles were inserted to allow gas flow. B. Gas system connected to the EPR quartz tube. C. The EPR quartz tube inside the high sensitivity probehead resonator. Please click here to view a larger version of this figure. Surface oxidation of carbon materials is of significant industrial and academic interest. The effects of carbon substrate oxidation have been characterized with a wide range of analytical techniques including EPR. When investigating the interaction of molecular oxygen with carbon substrate such as coal which has a propensity to undergo oxidation (hence its main utilization as an energy resource) sample preparation and storage is extremely important. Our samples are coal substrates that have been transported oversea in large cargo holds for the utilization in the energy industry. Even though the samples due undergo some oxidation during transport we attempt to hinder further oxidation by subsequently storing them under N2 and in a chilled area. As the samples adsorb water from the air prior to conducting measurements samples must always be dried under a vacuum at 60 °C for 24 hr. While the method of measurement is straightforward the conditions and type of measurement had yet to have been reported prior to our work7. It is important to ensure that the samples are properly dried, and to calibrate the gas flow and pressure at the gas-solid interface in order to enable accurate estimation of the kinetics. In this respect more sophisticated setups such as those previously experimented with for gas flow experiments can be adapted to enhance our results19-22. In order to ensure that the equilibrium is indeed reached, a sealed EPR tube with a carbon sample under vacuum or nitrogen environment must also be examined in order to determine the two limits cases. Careful manipulation of the setup, repetition of the experiment at various gas flow rates, does indeed lead to reproducible results. It was found that the tuning conditions in the EPR spectrometer is not affected by the flow rate of the gas and the nature of the gas. The preparation of the coal samples step is critical, in order to remove absorbed water from the carbon substrates. Adsorbed water on the coal samples can dramatically affect the tuning conditions in the EPR spectrometer and reduce the signal to noise ratio. The method described here is good for evaluating oxidation rates on carbon samples and to characterize the nature of radicals and paramagnetic species in the samples. It is thus possible with this simple method to determine the interaction of a gaseous environment on the solid substrate and see the effect on the radical species and nature in the substrate. In order to get more information on the coal samples, such as pore sizes, compositions, surface functional groups, other techniques such as elemental analysis, gas chromatography, NMR, BET, and FTIR are supplemented. The method described here as might have a future applications in the development of cheap ultra-sensitive oxygen gas sensors, as well as a probe for determining the activity of active carbon scrubbers. SR acknowledges the support of the Israel science foundation, grant no. 280/12. Jezierski, A., Czechowski, F., Jerzykiewicz, M., Chen, Y., Drozd, J. Electron parametric resonance (EPR) studies on stable and transient radicals in humic acids from compost, soil, peat and brown coal. Spectrochim. Acta A. 56, (2), 379-385 (2000). Ottaviani, M. F., Mazzeo, R., Turro, N. J., Lei, X. EPR study of the adsorption of dioxin vapours onto microporous carbons and mesoporous silica. Micropor. Mesopor. Mat. 139, (1-3), 179-188 (2011). Pilawa, B., Wieckowski, A. B., Pietrzak, R., Wachowska, H. Multi-component EPR spectra of coals with different carbon content. Acta Physica Polonica. A. 108, (2), 403-407 (2005). Kweon, D. -H., Kim, C. S., Shin, Y. -K. Regulation of neuronal SNARE assembly by the membrane. Nat. Struct. Biol. 10, (6), 440-447 (2003). Merianos, H. J., Cadieux, N., Lin, C. H., Kadner, R. J., Cafiso, D. S. Substrate-induced exposure of an energy-coupling motif of a membrane transporter. Nat. Struct. Biol. 7, (3), 205-209 (2000). Xu, Y., Zhang, F., Su, Z., McNew, J. A., Shin, Y. -K. Hemifusion in SNARE-mediated membrane fusion. Nat. Struct. Mol. Biol. 12, (5), 417-422 (2005). Green, U., Aizenshtat, Z., Ruthstein, S., Cohen, H. Reducing the spin-spin interaction of stable carbon radiclas. Phys. Chem. Chem. Phys. 15, (17), 6182-6184 (2013). Green, U., Aizenshtat, Z., Ruthstein, S., Cohen, H. Stable radicals formation in coals undergoing weathering: effect of coal rank. Phys .Chem. Chem. Phys. 14, (37), 13046-13052 (2012). Weil, J. A., Bolton, J. R. Electron Paramegntic Resonance: Elementary theory and parctical applications. 2nd edition, John Wiley & Sons. New Jersey. (2007). Aizenshtat, Z., Pinsky, I., Spiro, B. Electron spin resonance of stabilized free readicals in sedimentary organic matter. Org. Geochem. 9, (6), 321-329 (1986). Dellinger, B., et al. Formation and stabilization of persistent free radicals. Proc. Combust. Inst. 31, (1), 521-528 (2007). Kausteklis, J., et al. EPR study of nano-structured graphite. Phys. Rev. B. Condens. Matter Mater. Phys. 84, (12), 125406-125411 (2011). Pol, S. V., Pol, V. G., Gedanken, A. Encapsulating ZnS and ZnSe nanocrystals in the carbon shell: a RAPET approach. J. Phys. Chem. C. 111, (36), 13309-13314 (2007). Ross, M. M., Chedekel, M. R., Risby, T. H., Lests, S. S., Yasbin, R. E. Electron Paramagnetic Resonance spectrometry of diesel particulate matter. Environm. Int. 7, 325-329 (1982). Tian, L., et al. Carbon-centered free radicals in particulate matter emissions from wood and coal combustion. Energy Fuels. 23, (5), 2523-2526 (2009). 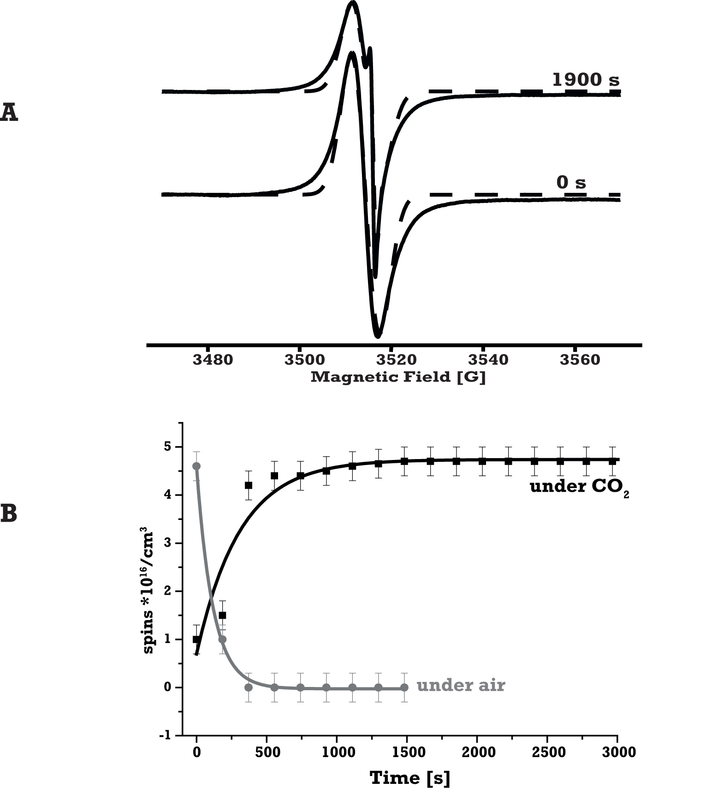 Jiang, J., Bank, J. F., Scholes, C. P. The method of time-resolved spin-probe oximetry: its application to oxygen consumption by cytochrome oxidase. Biochemistry. 31, (5), 1331-1339 (1992). Jiang, J., Bank, J. F., Scholes, C. P. Subsecond time-resolved spin trapping followed by stopped-flow EPR of Fenton products. J. Am. Chem. Soc. 115, (11), 4742-4746 (1993). Lassmann, G., Schmidt, P. P., Lubitz, W. An advanced EPR stopped-flow apparatus based on a dielectric ring resonator. J. Magn. Reson. 172, (2), 312-323 (2005). Breckenridge, W. H., Miller, T. A. Kinetic Study by EPR of the Production and Decay of SO(1Δ) in the Reaction of O2(1Δg) with SO(3Σ. J. Chem. Phys. 56, (1), 465-474 (1972). Brown, J. M., Thrush, B. A. E.s.r. studies of the reactions of atomix oxygen and hydrogen with simple hydrocarbons). Trans. Faraday Soc. 63, (1), 630-642 (1967). Hollinden, G. A., Timmons, R. B. Electron Spin Resonance study of the kinetics of the reaction of oxygen (1. DELTA.. zeta.) with tetramethylethylene and 2,5,-dimethylfuran. J. Am. Chem. Soc. 92, (14), 4181-4184 (1970). Westenberg, A. A. Applications of Electron Spin Resonance to Gas-Phase kinetics. Science. 164, 381-388 (1969). Stoll, S., Schweiger, A. EasySpin, a comprehensive software package for spectral simulation and analysis in EPR. J. Magn. Reson. 178, (1), 42-55 (2006).